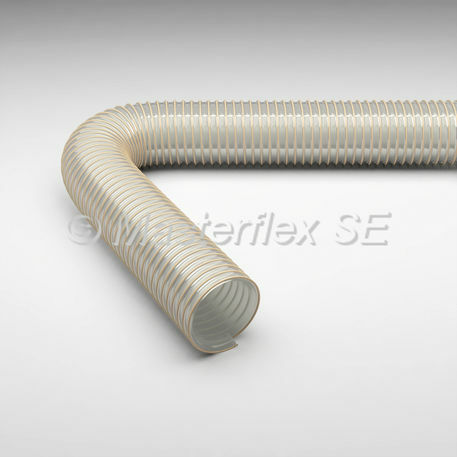 Masterflex's Master-PUR L Trivolution contains a spiral which is made up of a spring steel wire. Its wall is made up of 100% pure polyurethane as it has an inner lining which is composed of an application-optimised polyurethane 60° Shore A. The temperature range of the product is -40°C to +90°C and it can be applied to any applications where easy-to-clean surfaces are needed. It is also recommended for suction and transport hose for extremely abrasive solid, liquid and gaseous media and it is suitable for the applications including a conveyor and loading plants. The hose can resist microbe, chemical, abrasion, pressure, vacuum, UV and ozone.